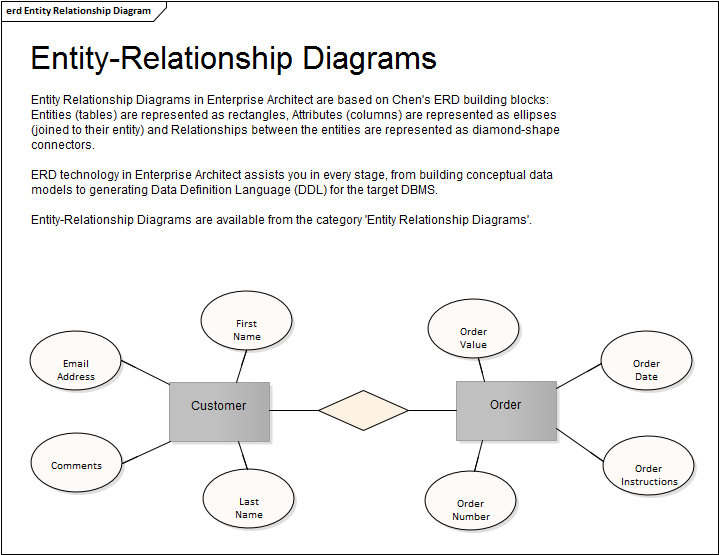 The Entity Relationship Diagram is a visual device used to model information or data and is used as a schema that is a precursor to database modeling. 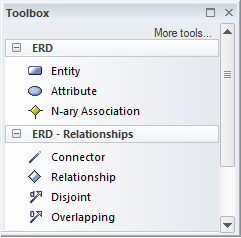 There are a number of different representations that can be used but the style used in Enterprise Architect uses rectangles to represent Entities, ellipses to represent Attributes and diamonds to represent connections between Entities. They are used by some data modelers as a way of ensuring independence from the physical data models that are used to represent the schema of a given Relational Database Management System database. They also provide a more appealing means of communicating with non technical stakeholders. Entity Relationship Diagrams can be drawn to include all of the Entities in a given domain in a single diagram or, alternatively, a number of diagrams can be created for different aspects of the domain. Diagram Filters can be used in presentations to focus on specific parts of a diagram that are of interest to the audience. The Documentation Generator can also be used to produce a data dictionary describing the Entities, their Attributes and their relationships with other Entities. There is a toolbox which contains a range of elements, relationships and Patterns for creating Entity Relationship diagrams. The Entity Relationship diagram (like any diagram) can be viewed as an element list, which makes working with the element's properties easier. Diagram Filters can also be used when presenting the diagrams to draw attention to parts of the diagrams, and the diagrams can be presented as hand drawn or in a whiteboard style by changing the properties of the diagram.